On September 30, 2000 12 year old Muhammad al-Durrah became an icon. During a Palestinian demonstration, a video was taken of him and his father crouching behind a concrete cylinder as there was shooting between Palestinian gunmen in Gaza and Israel Defense force troops protecting the Nezarim settlement. The video, which was filmed by Palestinian cameraman Talal Abu Rahma, was purporting to show Muhammad and his father being shot at by Israel troops and Muhammad being fatally injured. The video and commentary was broadcast by the France 2 television station and provided free of charge to all networks. The imagery of the purported al-Durrah martyrdom became associated with the Palestinian cause. At that time, nobody thought that the video was a fake with the commentary provided by the cameraman Talal Abu Rahma and journalist Charles Enderlin a lie, a part of Palestinan propaganda. But now evidence provided in French courts prove that this is so. 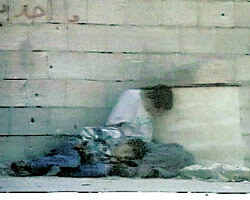 Muhammad al-Durrah did not die in the video and the whole scene was staged. The bullets fired at the father and son had to have come from the direction where the Palestinian gunmen were positioned and it was impossible for them to have come from the direction that the Israel Defense Forces were positioned. So says Jean_Claude Schlinger, the French court appointed ballistics expert, who has served as an ballistics and forensic expert in French courts for over twenty years. This modern-day blood libel directly resulted in hundreds of Jewish and Arab deaths. It ignited a still-burning torch of hatred against Israel, while images of al-Durrah are being presented in anti-Israeli demonstrations up to this day in Iran, the Arab world, Western Europe, and on the campuses of American universities only for the purpose of raising France 2's ratings. This was perhaps the greatest journalistic hoax perpetrated in the last hundred years. There is much to write about this Palestinian hoax. Here we limit ourselves to the one aspect: the 10 seconds of the video clip that purportedly showed the death throws of Muhammed al-Durrah. This 10 second video clip France 2 withheld with the statement that it was too terrible for the public to watch. The video can be seen at youtube. The video clip shows the natural motion of Muhammed peeking at the camera filming the hoax. And this is the real reason that France 2 withheld it and released it only upon court order. The clip clearly contradicts the France 2 story of the martyrdom of Muhammed al-Durrah. Those interested in reading more about this hoax, can check out seconddraft.org, a web site devoted to investigating this media hoax. Also there are many al-Durrah videos that can be found on youtube. Our conclusion is that the cameraman Talal Abu Rahma is a swindler and charlatan. Evidently, this is not the first time he has staged a scene. This case highlights how distressingly easy it is to manipulate coverage of a story and how such manipulation can have worldwide and lasting impact, in this case directly fanning the flames of anti-Israel hatred throughout the Moslem world and Europe. Not only did France2 violate numerous principles of journalistic ethics in running the story as it did, but it added to these violations by blocking any reconsideration. As the evidence that contradicted every major contention in the aired report emerged, France2, as well as other mainstream media outlets in France, worked to prevent any correction from reaching the public. On the contrary, France2 attacked independent French citizens who had the temerity to criticize the TV station for their journalistic incompetence by suing them in court for defamation. In the asymmetrical warfare of global Jihad against the West, the 'weak' side treats the media of the 'strong' side as a theater of war, and no single case illustrates Western journalism's vulnerability to this kind of manipulation than the Al Durah affair. September 30, 2000 corresponds to the Hebrew date the first of the month of Tishrei. We therefore pair keywords for this date with Muhammed al-Durrah. We try the date in the three standard possible spellings. For the boy's name, we try al-Durrah, M. al-Durrah, and Muhammed al-Durrah, making a total of 9 possible experiments. Each experiment was set with the expected number of ELSs set to 40. The best experiment produced a p-value of 4.5/1,000. Using our standard way of combining experimental results trial by trial, the probability that using the ELS random placement text population, one of the experiments would produce a result at least as good as the best experiment produced by the Torah text is 37/1,000. This best result is shown below. With expected number of ELSs set to 40, the probability that a text from the ELS random placement text population would produce a table as compact as that produced by the Torah text is 4.5/1,000. The cylinder size produced by the search was 77 columns. The combined p-value, taking into account the 9 experiments, was 37/1,000.